It is Wednesday and since we haven’t heard anything from the local authorities with regards the progress of cleaning up the ravine, we decide to visit the town hall once again- as Wednesday mornings are an opportunity for ‘an audience’ with the Mayor. This time, we are received with less gentility – I feel we are rapidly falling out of favour and towards being a pain in the proverbial. Nothing significant has happened in the last two weeks, other than that the story has once again changed. It seems that the contract for cleaning ran out at the end of December and a new one hasn’t really been put into place, so the waste offices are in a bit disarray and cannot deal with any extra demands. On top of that, the news is that the cleaning of the ravine has been lumped together with two other clean-up projects and the three of them are out to tender, which will take a minimum of 15 days before a firm can be appointed, after which there are still more bureaucratic hurdles to jump before anything can happen. Giovanni the vice mayor gets a bit exasperated having to explain all this, after all he’s not responsible for the waste department but the tourism officer. In the end, he promises to send us an SMS with updates by Tuesday (which he hasn’t done!) and, if there is no progress, to take us to the regional office. In the waste office, a man we haven’t met before looks at our photos and says, in his opinion, nothing will move until the summer at the earliest, and in any case it will be a very costly operation – in the region of 20,000 Euros, or more if the bridge proves not to be strong enough to hold ‘recovery’ vehicles. I bump into Sergio (the consigliere) in the corridor and when I ask him how the story about the CCTV camera is unfolding, he just shrugs his shoulders and rolls his eyes – there’s no reply from the authorities on this front. He seems to imply that a lot of talking may have happened but not much action. While we are talking, the mayor passes us and studiously ignores me. I’m sure he remembers that 2 weeks ago he promised us that the ravine would be clean in the space of 10 days. In short, nothing has moved and the stories change with every visit to the town hall. Meanwhile fresh rubbish arrives in the ravine almost daily and stray dogs help themselves to the freshly dumped horses’ heads. Maybe it’s time to go to the press? Posted in Spazzatura Siciliana, Uncategorizedwith 1 comment. Now that we have the mayor’s promise that the ravine will be cleaned (still waiting to see it happen before really believing it though! 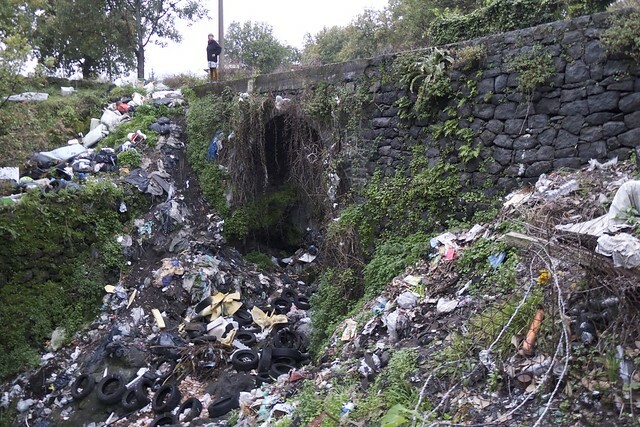 ), we start thinking one step ahead of the people who will arrive with their cars loaded with rubbish to find their favourite dumping spot transformed and CCTV cameras in operation… They will of course drive on and look for the nearest suitable spot to dump their stuff – which in this case would be the top end of Passopomo where there is a little hole in the fence and some people already have made use of it to dump a few bags, a buggy, several sacks of cement, some roller blinds, old plant pots etc. So one morning Frank and I go armed with a wheel-barrow and netting to fix the fence and remove the rubbish. We make acquaintance with the neighbour who watches us suspiciously to start with but eventually even introduces us to his wife and comes out to help a little. A couple of hours and the fence looks as good a s new and no more rubbish is to be seen. Next, we need to find some second hand Christs and Madonnas to spread around the place, maybe cement some on the bridge, because apparently people refrain from dumping in the presence of a holy audience. Rosy thinks it’s hilarious that we might scour the rubbish dump of the local cemetery for unwanted religious icons. We might even go to the local priest and see if we can’t get him to donate a figurine. The pollution in the ravine troubles Frank and me. But we don’t really know what to do, it is beyond our ability to bring all this back up the slopes! It seems indicative of the Sicilian attitude to rubbish: we see the young ones on a regular basis dropping plastic wrappers once they’ve eaten the contents, and none of the adults remark on it. The amount of plastic used in general is shocking: each meal new plastic plates, forks and cups are used and thrown away. It’s also hard to find a place where one can correctly dispose of rubbish. We have several bags in our van and have repeatedly asked various people, but most don’t know where we can officially dispose of them. One person offers to take the stuff to the recycling place in his town but when he says he would have to pretend it’s his, I politely decline – this is part of the whole story and I want to find out what are the correct options. In the end, Chantal takes me and our rubbish to a place 5km from here, where we find large bins by the side of the road. They are marked – plastic, paper and general rubbish – but they are filled to the hilt with a total mix of everything, so there is no use separating our stuff out. Besides, they don’t have lids and are so full that one big wind will take away most of the top layer and generously spread it around the area. Chantal says that they used to have better facilities, but someone set fire to them. 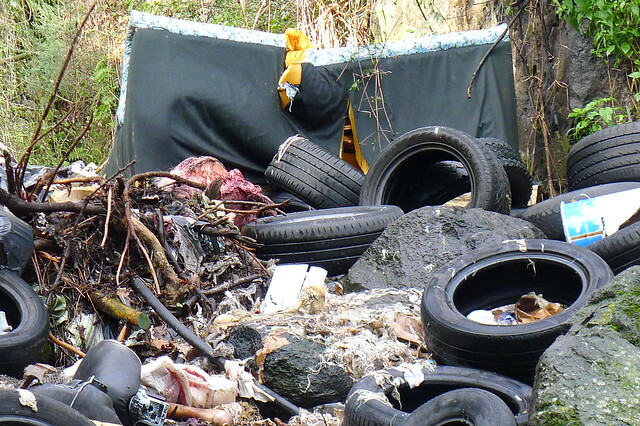 It is costly to dispose of rubbish correctly, I am told, and various people recount stories of illegal dumpings just outside their property gates. One day, a whole lorry-load of builder’s rubble was dumped on the top end of Passopomo, making it impossible to exit with the horses. Rosi had to pay for its removal if she wanted to be able to take people on rides along this route. 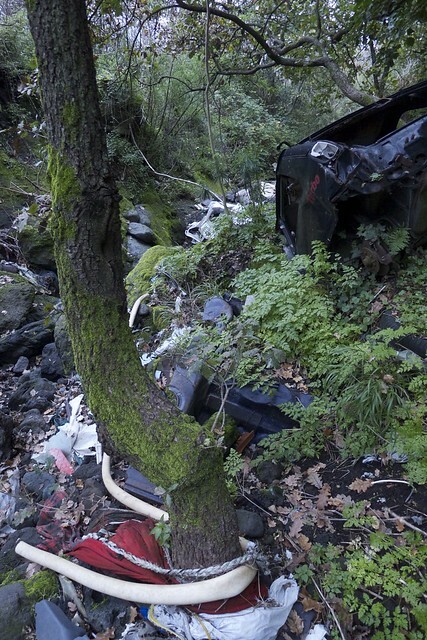 Nobody ever tells a story of someone having been successfully fined for illegal dumping. 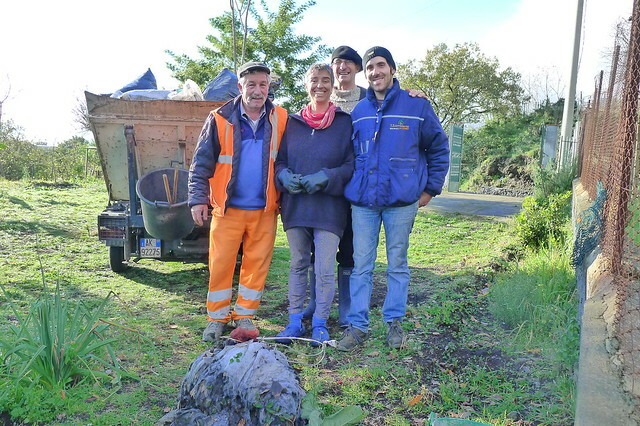 The only success story we hear is that a friend of Chantal’s, after repeatedly clearing up an illegal dump just outside his property, hit on the brilliant idea of erecting a big statue of Christ in the very spot. That stopped the dumping from one day to the next, although they proceeded to dump 200mtrs further up the road instead. People we tell about the ravine either shrug their shoulders saying there’s nothing that can be done about it or they change the topic. 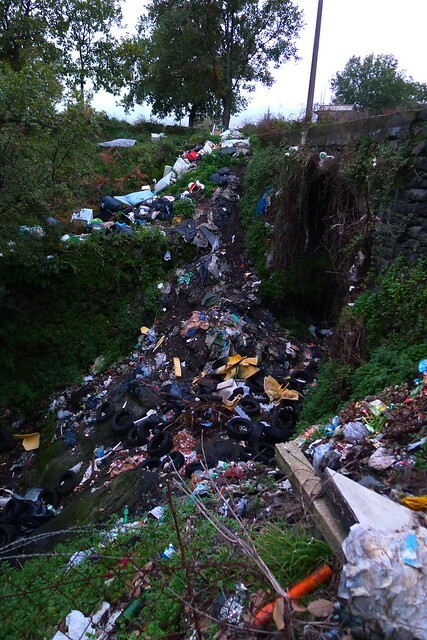 Most laugh when we suggest contacting the local government to come and clean up. Very few can be persuaded to come and have a look and possibly help with ideas or action. Frank and I have decided to start cleaning some 200mtrs below the bridge and just do a bit every day, slowly working our way upstream. We have a few people helping, each day a different team, most notably a neighbour who spots us on the first day and comes with hammer and pickaxe, as well as clearing a path below his property to help get the heavy stuff out of the ravine. This morning, we spoke to someone else who recommended other points of contact in addition to the local government, so we have a bit more research to do in the next few days. Meanwhile, the ravine slowly transforms from squalor to a spot of outstanding natural beauty. It’s hard work but actually very satisfying and good fun. We’ve cleared about 60 mtrs in 4 days. However, the race is on because as soon as there is heavy rainfall, more rubbish will definitely be swept down by the inevitable torrents. Posted in Spazzatura Sicilianawith 3 comments. We arrive in Passopomo during a torrential downpour on the morning of December 20th. There is a whole group of people waiting for the weather to clear so we can go horse riding, but it doesn’t let up, so we share lunch in the rain and then people disperse. 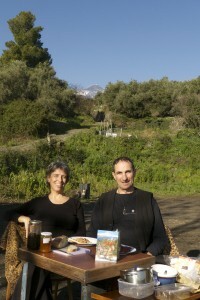 Towards the evening, the clouds lift and we begin to see what a beautiful place we have arrived in: to the north, we see Mount Etna, quietly smoking (apparently we just missed a fairly spectacular eruption) and to the South, the land gives away, with spectacular views all the way down to the sea. The stables lie in the centre of a large estate with vineyards, olive, orange and mandarin groves. We have taken residence in the car park, which is covered in black volcanic grit that dries out as soon as the rains stop. What strikes us when we open the door on the first morning is the amount of rubbish that is lying around just outside out doors. So as per usual, we take some time to clear our temporary ‘garden’ (little do we know just how long we will be encamped here…). What is it that people in Sicily don’t seem to see how ugly all this plastic is, let alone dangerous for animals? 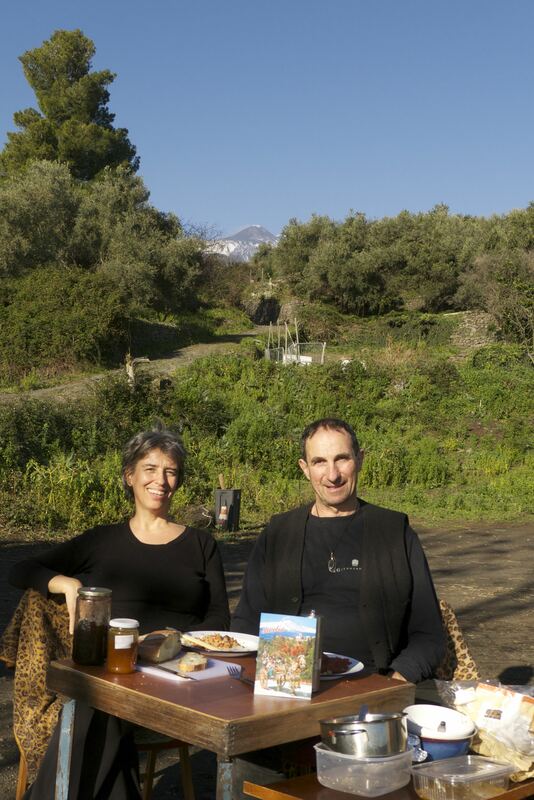 Two large rubbish bags later, we sit down for a breakfast in the splendid sunshine. I am writing this chapter two weeks after the fact, and the contrast between the Beautiful and the Ugly continues. We have never been in such a beautiful place, combined with the openheartedness of people, and the joy of being surrounded by a bunch of horses that are so calm that some of them can be let out to roam freely during the day. 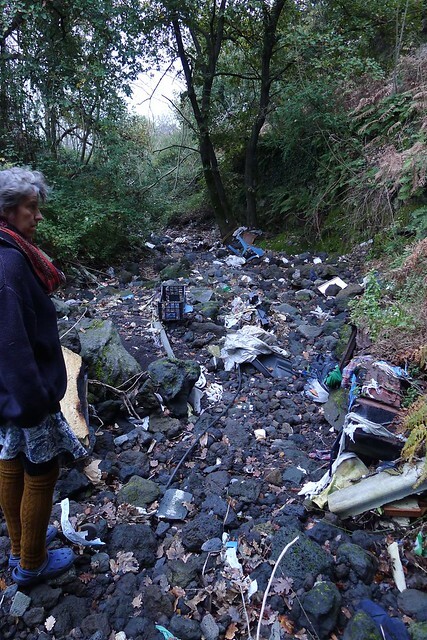 Our encounters are so manifold and rich that they warrant a whole load of chapters – but so is our discovery of a terrible fly-tip just on the border of the property, where people abuse the fact that a quiet road crosses the riverbed on an old bridge, to chuck their rubbish, letting it spill into one of the most beautiful ravines we have ever seen. 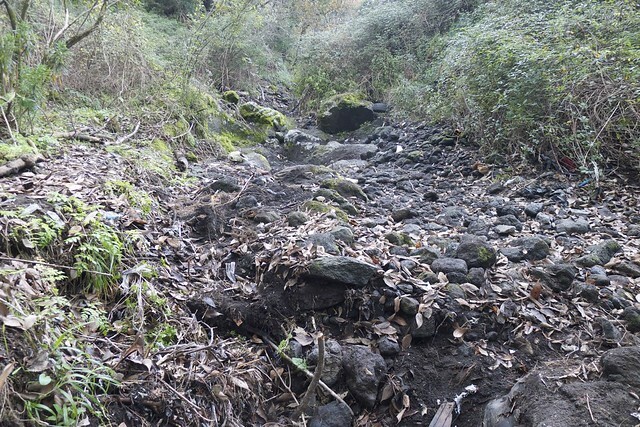 Most of the time, this ravine is dry, but there are clear signs that once the winter storms come, the rubbish is swept down and along with great force, distributed and embedded between rocks and volcanic sand, or wrapped around trees. Whole cars fold themselves along the line of this force. We are stunned by the contrast, and shocked into action. In the following chapters we will share our discovery of the beauty of this this area, as well as its ugly pollution, and you will see how we progress (or not, as the case may be) with the cleaning of the ravine, and whether and how the people around us and in the local government respond. Posted in Spazzatura Sicilianawith no comments yet.